Sure, you’ve played a lot of games, but how many have you spoken to? Bot Colony is a game that lets you talk to it. It’s all about having conversations with robots whose conversations are pieced together by an intelligent AI. Unlike most other games about conversing, in Bot Colony you’re able to freely type (or speak) what you wish into the game, and the robots will be able to produce an answer, generated dynamically. A recent “mega update” integrated Microsoft’s Cognitive Services Speech API with the game so it now works better than it’s ever been. It should be a step up from the robotic conversations you typically have in a videogame – you can even teach the robots new knowledge and commands. 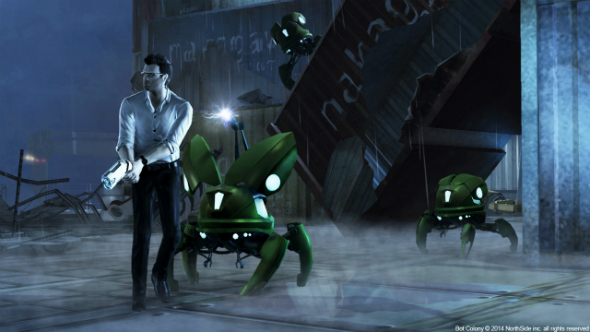 The reason you’re talking to these robots is because you’re investigating a mystery. The Nakagawa Corp., Japan’s leading robot manufacturer, had its facilites in Agrihan island in the South Pacific infiltrated. The robots stationed there are now acting strangely, so you need to talk to them, find out what they recorded and what they know, in order to figure out what happened. We’re giving away 25 copies of Bot Colony on Steam. If you’d like to win one then all you need to do is enter via our widget below. Every action you complete is worth one entry into the giveaway, and the more actions you complete the more chance you’ll have of winning. We’ll also need your email address so we can send you a code upon winning – we won’t send you spam, we promise!